Here we see the east wing gable end. The Tyvek house wrap has been installed. Also if you look closely you can see narrow strips of Tyvek have also been cut and fitted over the shrinkage channels above the windows. This helps to further seal the log home. If you notice under the edge of the roof you will see the roof framing. 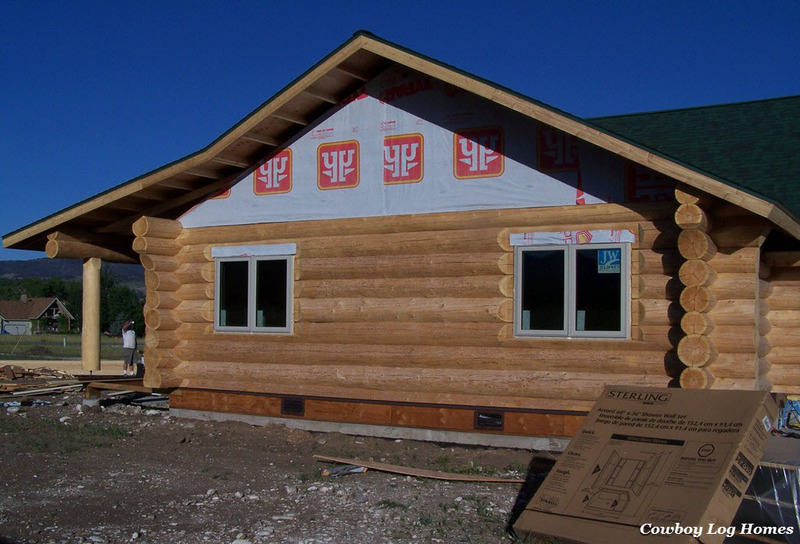 This will be covered with 1×6 pine tongue and groove wood siding, just like the front gables of the home. 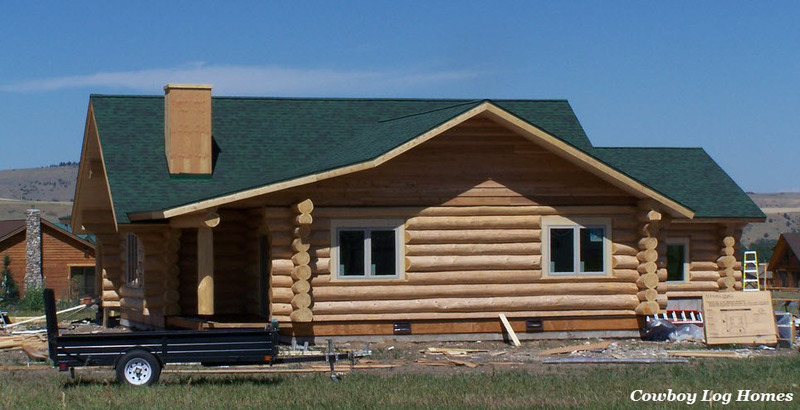 After the Tyvek is installed, then we use a brown metal gable flashing. 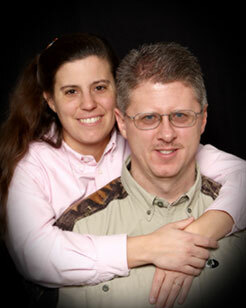 If you look closely at the next photo you will see a line of brown that runs along the top of the upper most row of logs. This is the gable flashing. Without this flashing snow and moisture can lay on the top of the curvature of the logs. 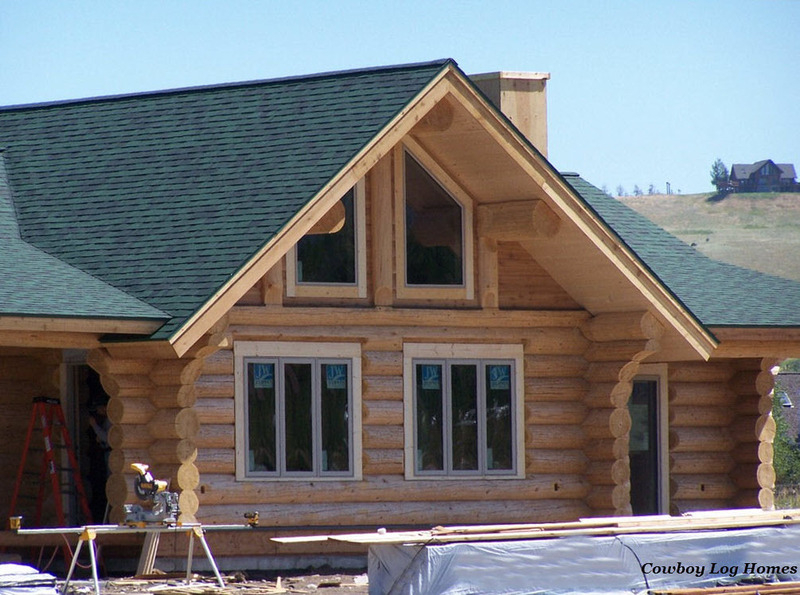 For the exterior of the gables our owners chose a 1×10 Western Red Cedar Bevel Siding. This siding installs similar to a ship lap. With the beveled feature it is wider at the bottom and narrower on the top. This provides the textured look. Here is the east bedroom wing gable finished. 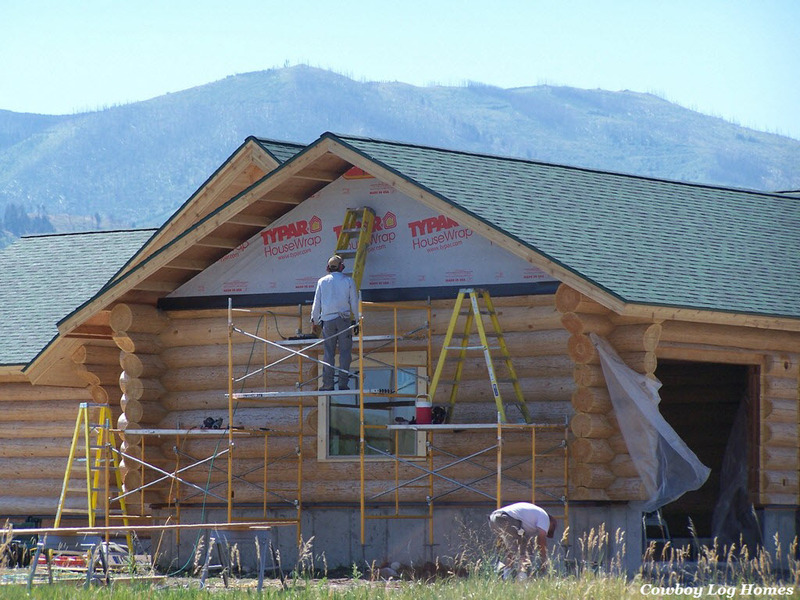 Our next photo shows the gable siding installed on the back of the great room peak. 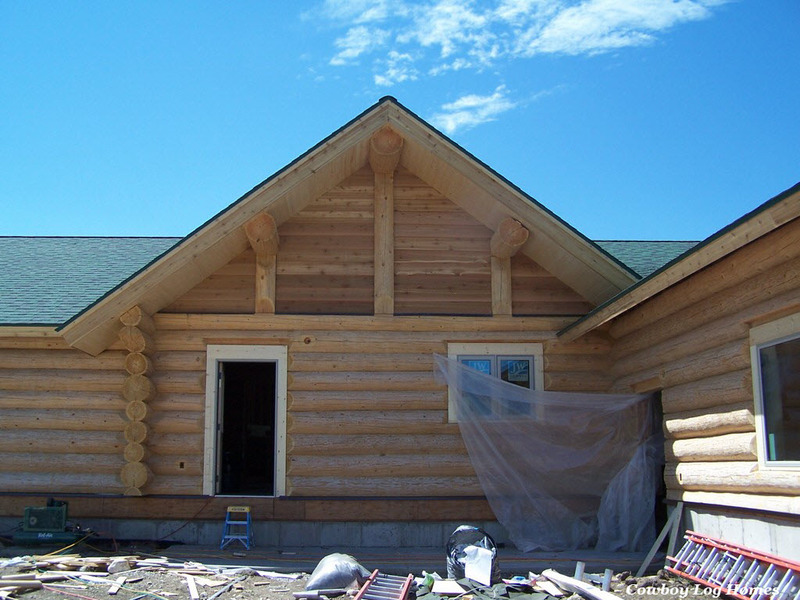 Vertical support posts for the roof system work in harmony with the cedar siding. Our next photo shows the gable end of the master bedroom wing. This home has a total of five gables. If you look closely at under the roof line you will see the soffit boards are a little different. Instead of running horizontally as on the front and rear great room gables, the soffit here runs parallel with the roof line. When using wood products there are all sorts of unique character touches which can be added to the home. 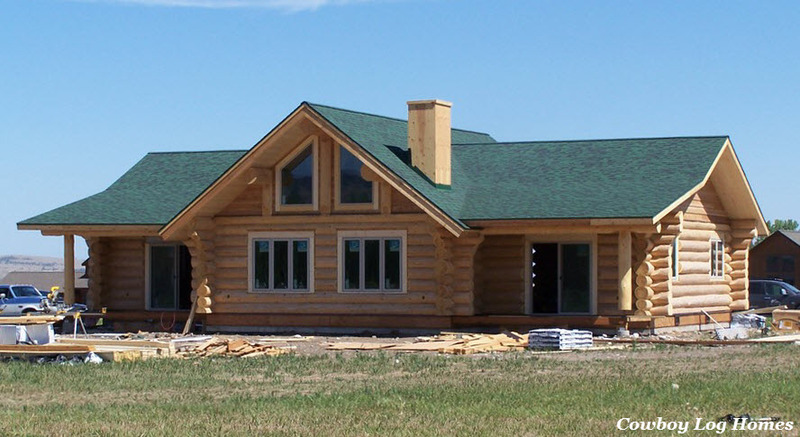 By simply changing the direction of the soffit a new dimension has been added to the aesthetics of this log home. As we near the end of day 11 we have an up close look at the front gable. From this angle you get a feel for how deep the gable over hang comes. 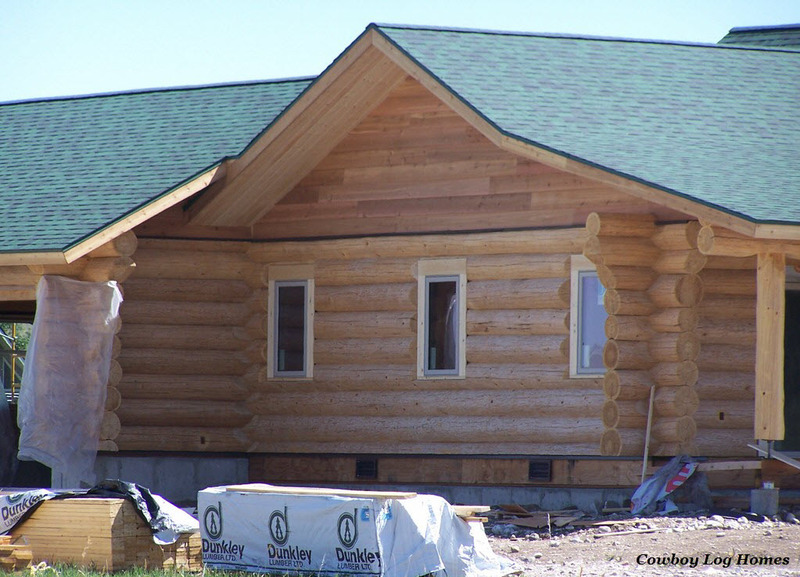 With this log home facing south, this wide overhang not only protects the logs but it also shades the great room windows during the middle of the day during the summer months. In the winter months, when the sun is lower, the sun’s rays shine into the great room giving off warmth.